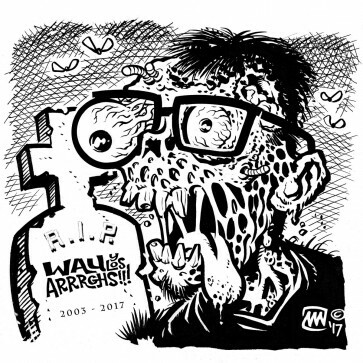 Originally released as a limited 7" on the band's own WAU RECORDS label, this WAU Y LOS ARRRGHS!!! single sold out in a flash at their farewell gig in May 2017. Copies of the OG press are selling for stupid bucks online, so we reissued it, this time around with brand new cover art from Canuck lo-brow illustrator hero Darren Merinuk, and souped up vinyl mastering by Crypt Records honcho Tim Warren. BONUS FEATURE: these are, without a doubt, two of the most action packed punk blasts we've ever heard from Wau and the gang, and it's now available again, worldwide for the first time, at the nice price. Limited opaque SKY BLUE Vinyl. Limited to 169 copies. Publicado originalmente como un 7” en el propio sello de la banda WAU RECORDS, éste single de Wau y los Arrrghs!!! se agotó en un plis en su concierto de despedida en Mayo de 2017. Copias de la primera tirada se están vendiendo a precios absurdos en internet, así que lo hemos reeditado, ésta vez con una nueva portada del genio canadiense del Low-Brow Darren Merinuk, y con unos retoques de masterización para vinilo por el capo de Crypt Records, Tim Warren. BONUS FEATURE: Éstos son, sin lugar a dudas, dos de los trallazos de garage-punk más salvajes que hemos oído de Wau y los suyos, y ahora está disponible otra vez, mundiálmente por primera vez, a un precio amigable. WAU Y LOS ARRRGHS!!! "El Mañanero" EP by Wau y los Arrrghs!! !